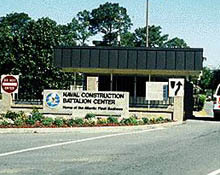 Naval Construction Battalion Center Gulfport (NCBC) is located in the city of Gulfport, Mississippi on the Gulf of Mexico. The area is pro-military and heavily populated with active duty Navy and Air Force personnel as well as Reservists and retirees. The center supports operating units of the Naval Construction Force and other tenants. The Center prepares for and supports all facets of the mobilization of construction forces including Reserve units.